Those two sentences were running rampant in my mind at the weekend when I went for a bit of a bimble around Ronda. It’s stunning, of course, and this wasn’t my first visit. It’s easily close enough for a day-visit but I’d decided to stay over and explore the surrounding area a bit. 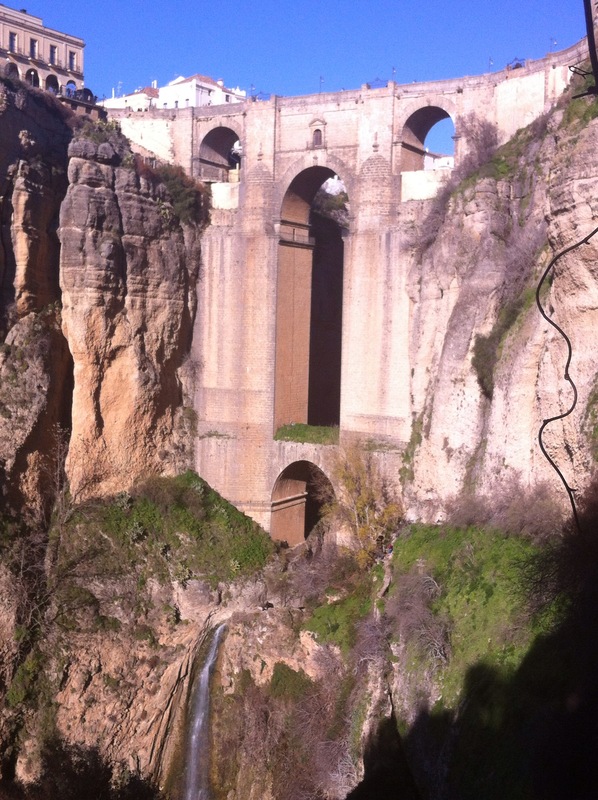 The gorge, cutting right through the centre, is what Ronda is rightfully famous for, 150 metres deep, with a dramatic bridge linking the two halves of the town. Every visitor who has ever been has a similar collection of photos taken from the top. The fit and the intrepid also have photos taken from the bottom. I’m not fit, and not usually particularly intrepid, but the temperature was about right – not too wet (which makes the path slippery), not too sunny (which makes it too hot and airless), and not too cold (which it can be, down there in the narrow shady gorge). Steps at first, nice and easy. Then a tiled path. Then mud, but a decent width. Then narrower. And rougher. And even narrower. And the drop was steep. And needless to say, there were no barriers. In the trickiest bits, there were occasional lengths of wire hammered into the cliff. At one stage a section had been edged with chicken wire, though this had then collapsed. Lower down, now out of any vestiges of sunshine, and becoming distinctly chilly, and the walker is faced with a narrow concrete footbridge to balance along. You can touch the cliff on your right, though at times it is a little too far to reach and you are on your own. Taking a deep breath, I tried to imagine I was taking a breathalyser test. “Come on Tamara, you are perfectly capable of walking in a straight line without falling over. Just because there’s a steep drop on one side doesn’t make it any harder.” Yeah, it didn’t convince me either. But I got across, and passed under the huge soaring arch to the calm pool of water, shaded and green, catching a shaft of sunlight. High above, out of earshot, the crowds of tourists are up there on the bridge, pointing down, shrieking with the fear of dropping their iPhone. Down here it is almost silent, yet we are in the heart of this busy bustling tourist centre – but hundreds of feet lower, feeling as though it is the centre of the earth’s core. Back up at the top I stop for a well-deserved caffeine boost. Dinner that night is at the famous Casa Maria, a little foodie heaven outside the ancient walls, away from the tourist centre. My hotel is central yet quiet and I sleep deeply, though a queue of Health & Safety inspectors tutting and shaking their heads and pointing at the gorge cannot be banished from my dreams. 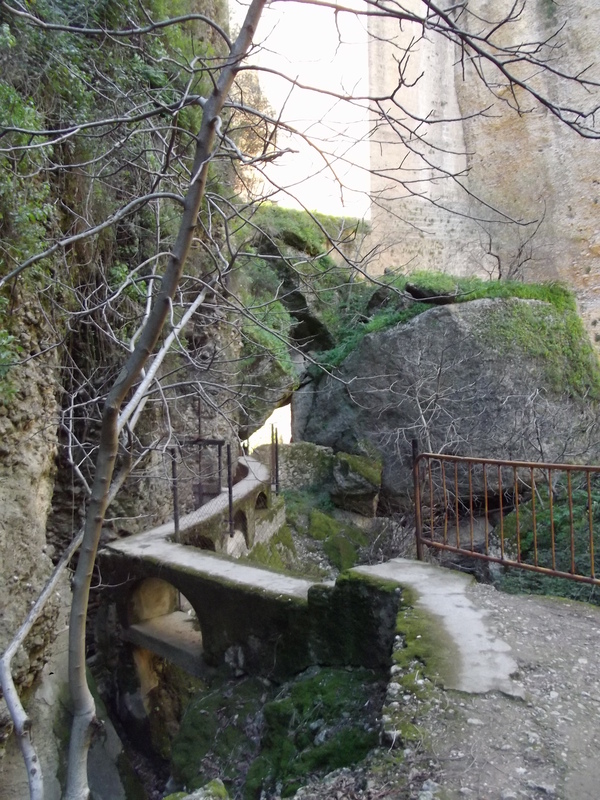 In the end a committee agrees that Ronda should be closed to the public and the gorge filled in with cement to avoid accidents and court cases. 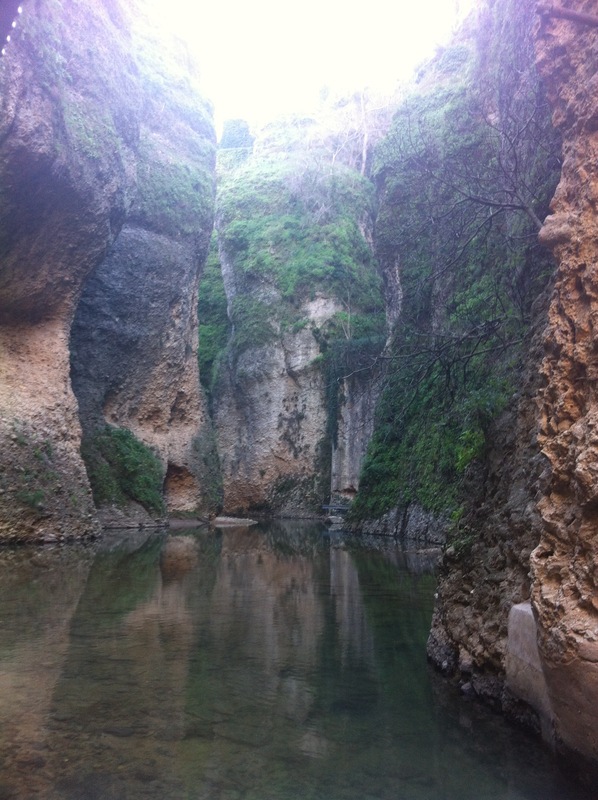 When I wake, I remember I am in Spain, so Ronda fortunately remains open, people follow the path down the gorge, and if there is the occasional accident, nobody sues anybody and perhaps another length of tatty chicken wire is nailed temporarily into place. I take a circuitous route home. 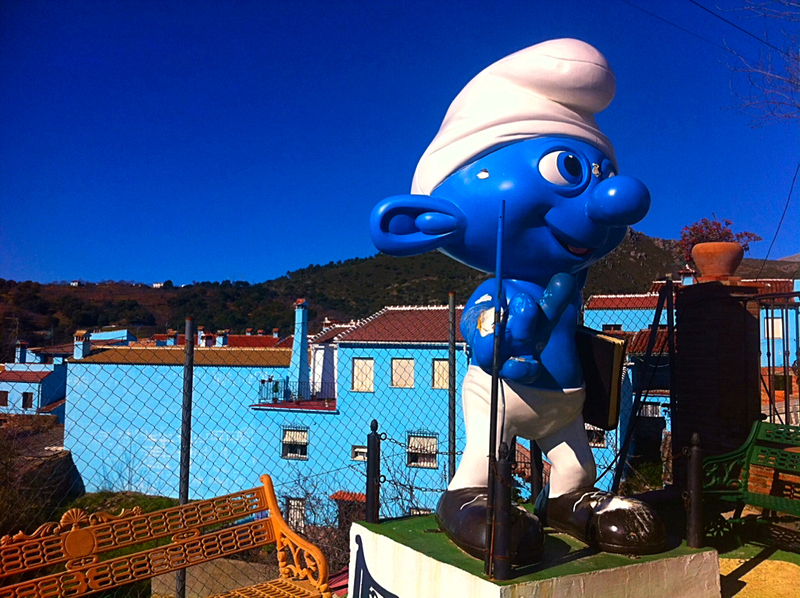 I had long wanted to see the Smurf Village, or El Pueblo de los Pitufos. Júzcar is its real name, and you would never go through it unless you were going there on purpose – it is on a big horseshoe loop of a road, that starts and ends near Ronda. It’s worth the drive – the views are stunning. The road curls round the mountain, hacked into the side of the cliff, an engineering miracle. A little narrow in places, but I am the only car I see all morning so I don’t have to do any complicated manoeuvres. I duck, at one point (pointlessly, of course) as the cliff overhang seems too close to the car roof. 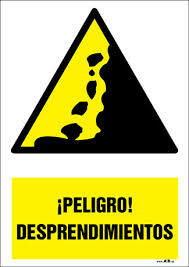 A sign tells me there is danger of rockfalls (peligro de desprendimiento) and a kilometre later signs with pictures of rockfalls are on every corner. A rough hand-scrawled plank of wood informs me that “Cristo salva” – Jesus saves. This is meant to be reassuring but has the opposite effect. 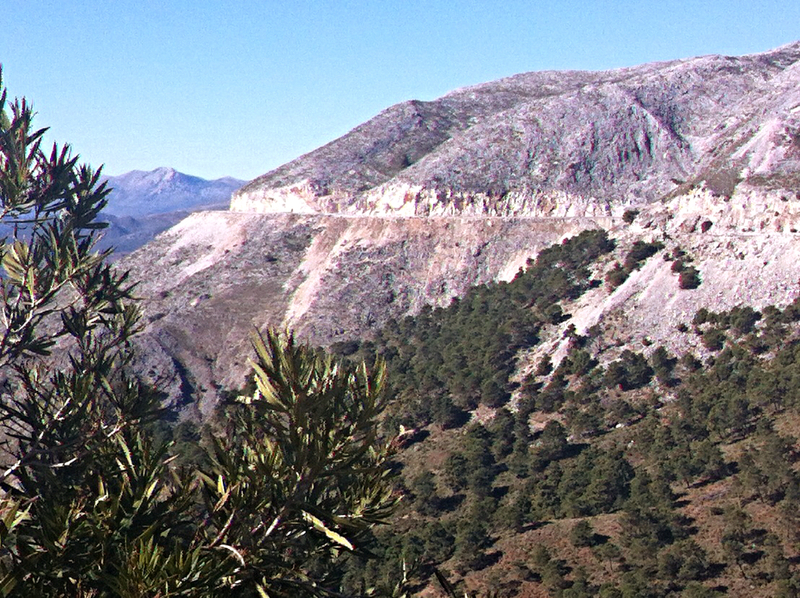 Driving lower into the valley, surrounded by jaw-dropping views, I reach Júzcar. They filmed the 2011 Smurfs movie there, and paid each householder a handsome sum to be allowed to paint the entire village Smurf-blue. The deal was that at the end of filming, they would paint everything back to its original white, leaving it all in better condition than before. But just before the end, the villagers held a vote, and decided to keep it blue. So instead of tons of white paint being delivered, they were supplied with if not a lifetime’s supply then at least a good few coats-worth of the Smurf blue paint. Since then a few households have rebelled and gone back to white, but the majority have remained blue, and the village now has a children’s playground and a large Smurf statue, courtesy of the film company, plus a regular trickle of tourists who make the pilgrimage to take their photos, have a quick drink at the one bar, and leave. My home town in Dorset is blessed or cursed in a similar way. 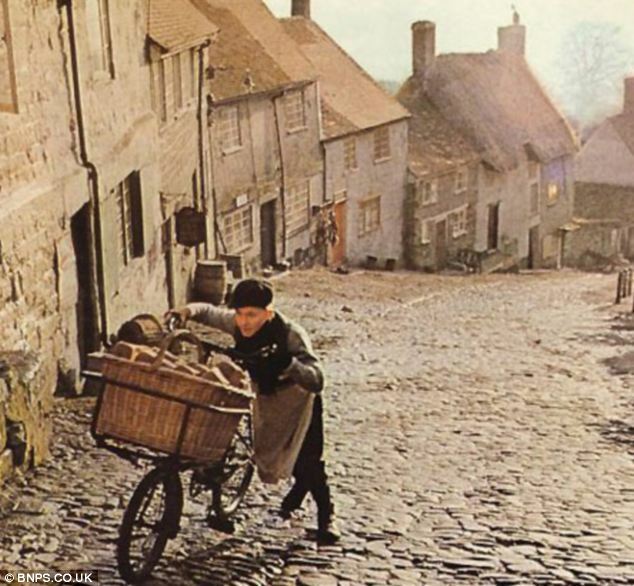 A steep cobbled street in the centre of Shaftesbury became famous as “the Hovis Hill” after the 1973 bread advert with the boy pushing the baker’s bike up the hill. Tourists pile off the coaches, walk 15 yards to the top of the slope, take their pictures, maybe have a coffee, and leave. They are invaluable to the town’s economy, and a right royal pain at times to some residents. And those who live on the famous hill street cannot put up satellite dishes or anything that demonstrates modernity, as film and tv rights bring useful revenue. But at least nobody in Shaftesbury had their house painted blue or was left feeling that they now live in a permanent children’s playground or elf theme park. This entry was posted in Dorset, Spain and tagged Andalucia, Hovis, Juzcar, Ronda, Shaftesbury, Smurfs, Spain by tamaraessex. Bookmark the permalink. Your narrative gave me vertigo even without pictures.